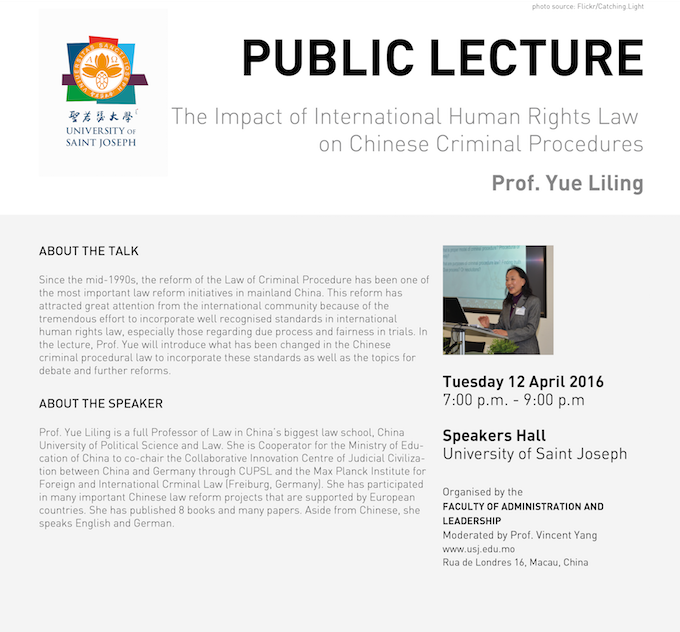 Public Lecture: The Impact of International Human Rights Law on Chinese Criminal Procedures by FAL on 12th April, 2016. Since the mid-1990s, the reform of the Law of Criminal Procedure has been one of the most important law reform initiatives in mainland China. This reform has attracted great attention from the international community because of the tremendous effort to incorporate well recognised standards in international human rights law, especially those regarding due process and fairness in trials. In the lecture, Prof. Yue will introduce what has been changed in the Chinese criminal procedural law to incorporate these standards as well as the topics for debate and further reforms. Prof. Yue Liling is a full Professor of Law in China’s biggest law school, China University of Political Science and Law. She is Cooperator for the Ministry of Education of China to co-chair the Collaborative Innovation Centre of Judicial Civilization between China and Germany through CUPSL and the Max Planck Institute for Foreign and International Crminal Law (Freiburg, Germany). She has participated in many important Chinese law reform projects that are supported by European countries. She has published 8 books and many papers. Aside from Chinese, she speaks English and German.